No matter how hard you try, there’s always something to clean and tidy, especially when you’re a busy parent. We’ve created a guide to help you keep on top of things, and also some advice if it’s all a bit too much! Create a list of what needs doing, putting what needs doing more imminently at the top, and what can wait at the bottom. Then go down the list, completing each task in order. If you have a partner, or children who are old enough to help out, delegate your tasks. When doing the washing up, get someone to dry up and put away. Get your children used to helping out with chores and they may even do some without even being asked. There will be some tasks that will allow you to do other tasks in the process. For example, whilst something is cooking in the over, get started on the dishes or take the bins out when you’re heading out. If you’re still struggling to keep on top of it all, even with this advice, we do offer a variety of services that could really help. We can come over and do a top to toe clean up of your home. This is popular for post party mess or even prior to an event coming up. 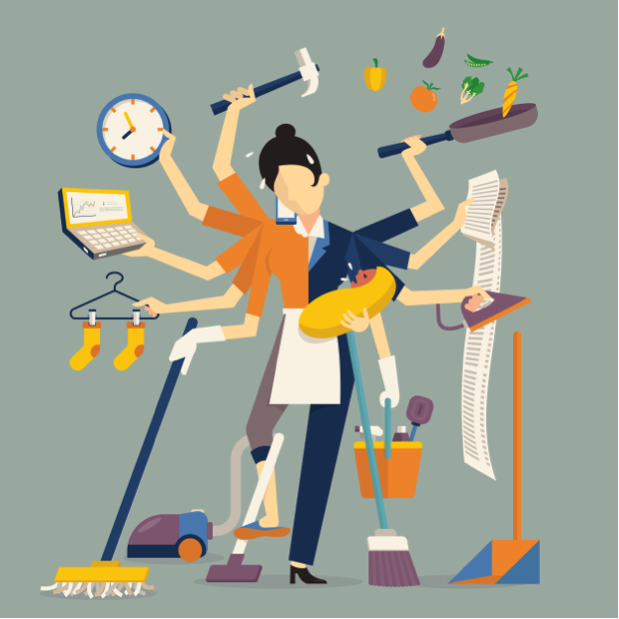 If you think you need more regular help, we can offer a maid service to complete daily tasks for you from regular domestic cleaning, to preparing meals and walking the dog. Ironing is one of the most dreaded tasks as it’s fairly time consuming and can require a bit more skill. We can take this off your hands, either by doing it at your home, or by collecting it and dropping it back off when it’s convenient for you. © Copyright 2014 Mums Helping Hands Ltd.